Rondos are a little-known Dutch treat. My wife brought a few home from a friend’s house, and once I tried it, I had to figure out how to make them. The Rondo is a rich, semi-gooey, almondy pastry that has just a hint of lemon zest. The middle half of the Rondo is filled with almond paste to make it extra gooey and rich. Mix the flour, lemon zest, baking powder, sugar and ½ egg in a bowl. Add the butter and knead this quickly into a smooth dough. Wrap in cling film and place in the refrigerator until firm (overnight is best). 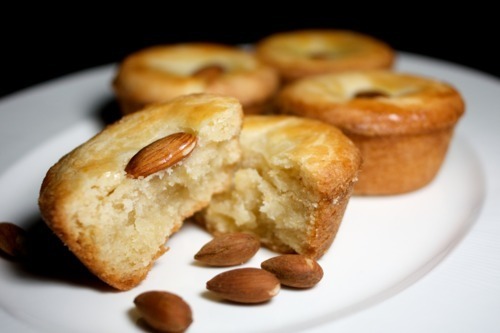 Preheat oven to 380 F. Mix the almond paste with the water until smooth. Take dough out of the fridge and give it a short knead. Roll out about ½” thick and cut out circles that will fit into a muffin tin. Place a dough disk on the bottom of the greased and floured muffin tin and scoop about a teaspoon of almond paste in the middle of the disk. You should have about ¼” of the dough disk edges visible. If you use cherries, you would also place a cherry in the almond paste. Put another dough disk on top. You don’t need to smash it on–just place it firmly. Brush the top with egg wash, place an almond on top, and brush again with egg wash. Bake for about 20-25 minutes (mine took about 17, but my oven runs hot) or until golden brown. Take them out of the molds at once and let them cool completely on a wire rack. I doubled this recipe and it yielded about 13 Rondos. I used a pastry cutter to cut the butter into the flour. If you roll the dough out a little thinner than ½” you should be able to increase the yield quite a bit. If you make your own almond paste, be sure to blanch your almonds long enough to make it easy to remove the seedcoat. I only blanched them the first time for one minute and it was a tedious experience to remove the seedcoat. Turns out that 2-3 minutes in boiling water is much more effective. I’m not kidding you when I say that these were one of the tastiest things I have ever eaten. Many of my friends felt the same way when they tried them.